If you find yourself with an early departure from London's Gatwick Airport, and unmoved by the usual lackluster array of dreary hotels in the area, take heart, for a new option has recently been added to the airport's lodging choices. 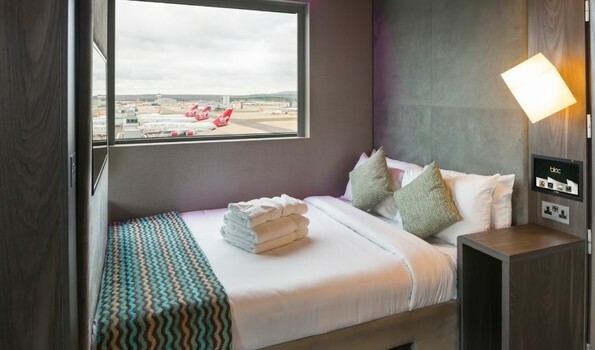 The BLOC Hotel Gatwick is located within the south terminal, accessed from the flight check in area where express elevators whisk guests to the reception, and then to the rooms on the upper floors. Rooms are compact, ranging in size from 9.5 square meters (Vista and Sleep rooms), through 12 square meters (Smart rooms) to 16 square meters (Aspire rooms). Sleep rooms are interior, without windows; the others all feature one or more large picture windows, some with views over the airport runway and apron areas. All rooms feature fast free WiFi, a large bed with luxurious premium cotton linens, a wet room with powerful monsoon drench shower, steam free heated mirrors, large fluffy bath towels and Invigorating Zenology bathroom amenities, and a Samsung Galaxy Tablet controlling lighting, electronic window blinds, Samsung climate control and Samsung LED Smart TV - all from your bedside. Smart rooms and above also feature work desks and / or sitting areas. The hotel does not offer any in house catering options, but situated as it is within the airport terminal, a range of eating, drinking and shopping options are within a very short walk from all rooms. During a recent stay, I found my Smart room to be quiet and relaxing, the bed extremely comfortable, and the WiFi fast and reliable.The best part was that within 5 minutes of leaving my room in the morning, I was in line at the check-in desk for my flight. The price is right too, with rooms starting as low as £59 per night. For future overnights at Gatwick Airport, I won't be staying anywhere else! Stewart Mandy stayed at BLOC Gatwick at his own expense.